As you know, I’m a thoroughbred Portagee (a nickname given unto my people, derogatory for sure). But I’ve embraced my inner pork chop—another needling dig—and have no qualms about who I am, what I’m called, and what I like. And one of the things I adore are bolinhos de bacalhau, or salt cod fritters. It would be considered cultural treason if I didn’t love these little fried nuggets of salt cod and potato goldenness. What’s not to love? We Portuguese have been marrying the two ingredients for centuries: Bacalhau à Gomes de Sá (casserole of cod, sliced potatoes, onions, hard-boiled eggs, and olives), Bacalhau à Brás (scrambled eggs encasing shoestring potatoes and flakes of cod), Bacalhau Cozido com Todos (basically, boiled cod, potatoes, and vegetables), and—well, you get the idea. So when The One and I recently went to Allium in Great Barrington, MA, and I took a look at the menu, for a moment everything around me went pleasantly fuzzy. Kind of like looking at the world through the wrong end of a smudgy telescope. There, at the top of the appetizer list, was bolinhos de bacalhau with harrisa aïoli. My countrymen were relying upon me, I told myself. So what if harrisa was a North African condiment? The real balls of the dish (pun intended) were the fritters. It was my national duty, being a citizen of Portugal, to order them. When the waitress, a jejune little thing who was utterly clueless as to the fritters’ provenance, put down the plate, I knew something was off-kilter. These were clearly different than the ones I grew up eating. The tidy, carefully shaped golf balls and quenelles of my formative years were replaced here with irregularly shaped, asteroid-like fritters with spiky ends and, on some, little beards of shredded cod, fried crisp. I’m sure if I looked close enough I could probably see the face of Christ, or, at the very least, Mrs. Sullivan, my unkempt high-school librarian. (Okay, so the photo above shows well-coiffed bolinhos. Old habits die hard. I shaped these with a spoon. So sue me.) I popped one of Allium’s fritters in my mouth, and those fuzzy ends shattered. They were nothing like the soft bites I’ve snacked on for decades. Besides being frittery, they were light—so light you couldn’t eat just one. Or seven. Confession: The One got less than his fair share, as I took advantage of his need to wash his hands before dining to get a head start. But what intrigued me most was the potato didn’t act like Spackle, filling in gaps and holding together these boca bites. Instead, the potato balanced the dish. These were, in short, some of the best fritters I’d ever had. After massaging the recipe out of the chef, Michael Pancheri, I instantly knew why these golden nuggets of deep-fried love were different. They weren’t Portuguese at all. They were, of all things, Spanish. Ack! Besides potato, this fritter called for a batter made from flour, water, and oil. Small distinction, I know, but it’s a colossal difference to a Portuguese. As I tried not to like them (I really, really did, but it was an utterly impossible task), I could feel a whole nation turning its collective shawl-covered back on me. Nothing comes between the Portuguese and their salt cod fritters. Especially anything espanhol. (The Portuguese have had an uneasy détente with Spain after centuries of Spanish one-upsmanship and better PR.) But I truly, madly, deeply loved these fritters. What’s a Portagee boy to do? What else? Master them. 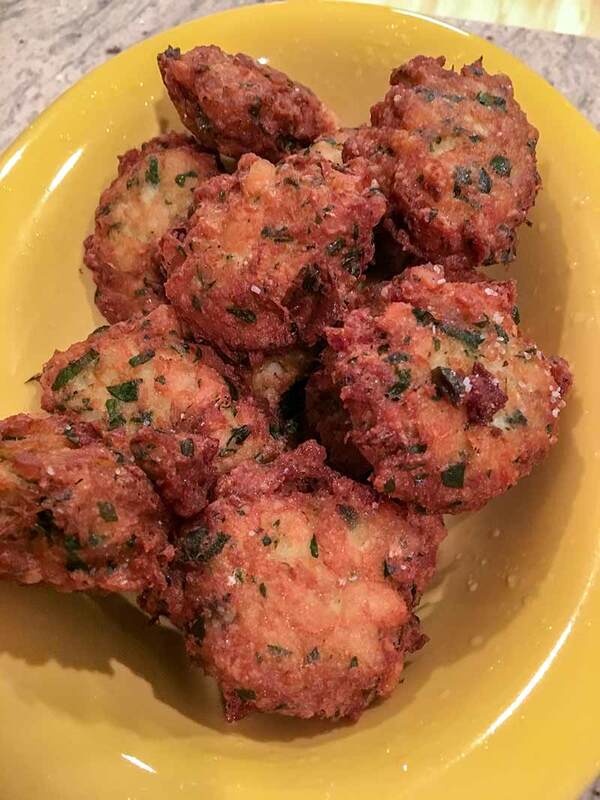 This past Saturday in CT, as I was stealing yet another treasonous bite of my perfected Spanish booty before serving it to The One and Brazilian cookbook author Leticia Moreinos Schwartz, a friend e-mailed me a link to a post about Portuguese salt cod fritters penned by the talented food writer Francis Lam. Then I saw his Tweet: “COD FRITTERS good enough to make even the Portuguese happy.” Oh, poor Francis. Poor, misguided Francis. There has been a four-decade-long kitchen war in the Leite clan over a fritter that can make just us happy, let alone an entire nation of citizens certain each of their mothers makes the world’s best bolinhos. Such sweeping generalities can get a man in trouble, my dear Francis. And, I don’t know about you, but I have feeling there’s a fritter a throwdown in our future. You, me, salt cod, and lots and lots of oil. If the provenance and particulars of the cod fritters that you fancy matter dearly to you, we understand. As for the rest of us, we’ll be forming the Coalition for Non-Racist Cod Fritter Consumption and just popping one after another into our pieholes without another thought to their origins. Up to you. 1. Rinse the cod well under running water to remove surface salt. Place the fish in a large bowl and cover with cold water by 2 inches. Stretch plastic wrap over the top, and refrigerate, changing the water several times until the cod is sufficiently desalted for you. Take a nibble—it’s perfectly safe to eat. If it’s too salty, change the water again, and let it sit for a few more hours. The process can take anywhere from 12 to 48 hours, depending on the type and size of the fillet. Above all, bear this in mind: You can always add back salt, but you can’t remove it from a finished dish. 2. Transfer the cod to a medium saucepan, add the onion and bay leaf, cover with fresh water by 2 inches, and bring to a gentle simmer over medium-low heat. Cook the salt cod until it flakes easily when poked with a fork, 10 to 12 minutes. Using a slotted spoon, transfer the cod to a plate, leaving the onion and bay leaf in the pan, and set aside until the fish is cool enough to handle. 3. Bring the water the salt cod was simmered in to a boil, drop in the potato, and cook until tender, about 10 minutes. Drain in a colander. Toss the bay leaf, keep the onion. 4. Dump the potato and onion into a bowl and mash them well. If the onion refuses to submit, really have at it, cutting it with a knife, if needed. 5. Remove any skin, bones, and miscellaneous bits and bobs from the cooled cod, then shred it. My grandmother vovó Costa used to dump the cod on one half of a tea towel, fold over the other half, and massage it, rubbing the towel back and forth with the heel of her hand until it left nothing but little clouds of finely shredded fish. The food processor does the same thing in 10 seconds. Sorry, vovó. Stir the cod shreds, garlic, and parsley into the potato mixture. Season with salt and pepper to taste. It’s not a bad idea to over-season a bit here, as the batter will tame the flavor some. Set aside. 6. Rinse the saucepan you’ve been using (a real one-pot meal), pour in the water and oil, and bring to a boil over medium heat. Shake in the flour slowly and stir with a wooden spoon to make a batter. It’ll be lumpy, but press on. A few more minutes and it’ll all work itself out. 7. Remove the pan from the heat and continue beating the batter for 2 to 3 minutes to cool it. Add the eggs one at a time, incorporating completely after each addition. 8. Add the cod mixture to the pan and stir to combine. It should be the consistency of a nice thick-enough-to-stand-your-spoon-up-in-it oatmeal. Let the batter cool to room temperature. This is the best part: If you wish, you can keep it for several hours and fry off the fritters whenever guests arrive, or when you’re in a white-hot state of hunger. 9. Heat 3 inches of the oil in a high-sided saucepan over medium-high heat until it reaches 350°F (177°C). Spoon out a rounded tablespoon or so of the batter, scrape it into the oil using another spoon—remember, irregular is better—and fry until golden brown and cooked through, 2 to 3 minutes. Drain on a brown paper bag (vovó always said paper towels make fried foods soft) and serve hot, hot, hot. Don’t give these puppies time to cool down and lose their crunch. Spanish Cod Fritters Recipe © David Leite. Photo © David Leite. All rights reserved. All recipes and photos used with permission of the publisher. A Portuguese making Spanish salt cod fritters? Much as David, I found this to be tough for me...what do Spaniards know about our 400 different ways of cooking salt cod? But I put my Portuguese pride to the side and decided to make this recipe. At first the recipe seems very similar to the Portuguese version of cod fritters. The main difference is that we don't create a béchamel-style batter. The end result was creamier, lighter, and less cod-intense compared to Portuguese fritters. I must say that if you're a virgin with salt cod, try these fritters prior to the Portuguese ones. The salt cod taste is much more subtle and somehow more elegant. I think this is a perfect addition for a cocktail party as well as a terrific appetizer or even a snack. Though they are indeed better just out of the frying pan, seriously, they're just as good nice and cold after an hour on top of the counter. For those of you who think you will not find salt cod around where you live, check out Latin American or Asian grocery stores. To make this recipe even more authentic Spanish, I would say to fry them in olive oil. Spaniards fry everything in olive oil. As I made 2 batches I fried the first ones in canola oil and the second in olive oil. Though the first batch was not as greasy and lighter, I did however like the olive oil taste in the second batch. And if you're eating the fritters with a spicy sauce, the olive oil will just enhance the whole experience. After all of them being fried I suddenly thought of adding smoked sweet paprika to the batter. I think it would really work well and be a nice Spanish addition. These cod fritters were amazing. I've eaten cod fritters before and even made them at home, but they were nothing like these. Soft, fluffy, and super crisp on the outside. So delicious. I served them as an appetizer with some chipotle mayo and oven-roasted Romanesco florets. When I told people the fritters were made with salt cod (you know, that dried, ugly-looking, smelly fish you sometimes see in specialty markets), they wouldn't believe me. Everybody loved them! And they're great for entertaining, too. You can make the batter hours in advance and just fry them off and serve them piping hot. I soaked my cod for about 36 hours, and it was pretty mild after that ( I actually had to add some salt later ). I than roughly shredded it by hand, and put it in the Cuisinart together with the roughly chopped cooked onion and 10 seconds was all it took. It worked great. I made the batter around noon and kept it in the fridge to fry it off at 6 that evening. No problems there. I used a #40 ice cream scoop (roughly 1 ounce/ 25 grams) to form the fritters. That worked perfectly to make uniform size fritters that easily released into the hot oil. The frying time in my case was about 4 minutes per side at 350°F—a little longer than stated in the recipe. I fried them in 3 batches and kept the already fried fritters in the hot oven on newspaper. They stayed nice and crisp. Bolinhos de bacalhau have been a mainstay of my entertaining repertoire for a long time. Crisp and salty, the fritters seem to be loved by everyone, even avowed fish-haters. I was introduced to them in Brazil, so the version I make is Brazilian, which is pretty much in line with Portuguese versions. This Spanish rendition, however, is a different animal. The first difference was that the onion in this recipe is boiled along with the salt cod, whereas in my usual version it's added raw to the potato and cod mixture. The cooked onion is completely soft and very mellow in flavor. This version calls for a flour-based batter, and I have to eat gluten-free. So a little adaptation was in order. I used sweet rice flour to make the batter. The flour made a thick paste when added to the oil and water, as expected. Everything looked good. And when the finished batter was added to the salt cod mixture, I had about the right texture as per the recipe description. But upon frying, the fritters were breaking apart and absorbing too much oil. Increasing the oil temperature did not help at all, so I added more flour to the fritter mixture. A total of 5 tablespoons did the trick, and after that, they fried up perfectly. The soaking time for the cod will vary greatly depending upon the thickness of the fillets. I'm afraid it's something you just have to get a feel for. I had very thin fillets, and a good rinse to get off the external salt plus a 24-hour soak in a bowl with no changes of water did the trick for these. Keep in mind that your salt cod will lose even more salt during the boiling process. As for breaking up the cooked fillets, I break them up by hand, then add them to the potatoes, and mash them all together. Now for the important part. How did they taste? Well, they tasted delicious, of course. How could fried potato and salt cod not be delicious? These do differ significantly from my usual version, and which is better is largely a matter of personal taste. 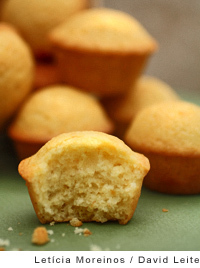 This version is milder in flavor with a fluffier interior and more delicate texture. Normally I don't think that salt cod fritters need any kind of a dipping sauce, but these were so mild, I wanted one. Wait one minute here...didn't the essay mention a harissa aioli? A quick rummage through the fridge and I'd whipped together an ad hoc version. Just some mayo, harissa, and a squeeze of lemon. It would have been better with homemade versions of the harissa and mayo, both of which can be found on this site. Wait! Better yet, make David's milk mayonnaise and season it with a bit of harissa. The lighter texture would be even better with these. Darn it, David – I ate way too many of these gems when I was in Brazil last year – now I have a violent hankering for them and I wouldn’t know for the life of me where to find salt cod in Singapore!! Muitas saudades para meus bolinhos!! Thanks for the recipe anyway… I have a mission now! Mom bought me your cookbook for Xmas…but you didn’t autograph it! Can I send it to you and you can autograph it for me? I love your Protagee comment….my oldest daughter, Rachel calls herself that. Anne, I’d be more than happy to. Please write me privately. On top of a great sounding recipe, your hint about smoked paprika aioli got me fired up to make some for dinner tonight. Thanks for the flash of creativity. Donna Rose, how did it turn out? What a beautiful, funny post! And those fritters…interesting, it’s like a Pate a Choux you finally fold all that goodness into in the end. Tantalizing. Must try this. Such a fun read and yet another proof that whoever invented pate choux is one hell of a genious. Or do we want to keep the French out of this discussion? Lol. I would love to try this soon. Thank you. My second official photo for the site. Any chance on getting the recipe for the smoked paprika aioli? Also, any recommendations on where to get smoked paprika? I was wondering if there is much variation between brands. An online source would be great. What kind of vegetable oil do you use for frying…Canola? Peanut oil? I was thrilled to find salt cod at the local grocery (we live in the boonies, so it’s often hard to find “rare” items). Looking forward to trying these. Hello, Deb. Simply add a teaspoon or so of smoked paprika to a batch of homemade aioli. If you want it a bit strong, add more. I use plain vegetable oil. Some people use olive oil, but the smoking point is lower. And you can find smoked paprika at any well-stocked supermarket. You can also find it online. Just thought I would share (as a fellow Portuguese and History buff) what the real root of the angst between Spain and Portugal is. It dates back to the centuries of multiple Spanish attempts at invasion and acquisition of Portugal. Portugal is the only piece of Iberia that has stayed independent and managed to avoid annexation by Spain. It makes for a history of uneasy bed fellows. Something like how the English and French still feel about each other. Poor Barcelona and the Basques have never managed to secure their freedom. They have their own beautiful languages which are not even similar to Spanish. I traveled thru Madrid and Barcelona last year and absolutely loved the country, its people and food. Must go back to explore more regions. Love what you bring to the Portuguese Table and culture. Ana, you’re right about the conflict between Spain and Portugal. Thanks for the details. I made these once and they were so delicious! After reading this I might need to make them again! A great way also to desalt cod fish is to use cold milk instead of using water. Not only does it do the same as the water but actually will smooth the taste of the cod. A nice little trick especially for the non-Portuguese that are not used to the strong taste of bacalhau! Thanks, Sofia. I sometimes simmer my cod in milk instead of water. It really gives the fish a lighter, somewhat sweeter taste. We are making this tomorrow. Couldnt find salt cod but we did get some nice looking cod fillets so will make do with these. Just too yummy to look at to not try. Hi Shirley, the quality will be different, as salt cod has a distinctive texture and more body than fresh cod. But let me know how it turns out. They turned out awesome. Better than the take out English style breaded fish that we love so much and have with french fries. We’re still going to try them with the salt cod but these were delectable. Our only regret was that we bought a small package of cod. No more take out for us. Brazilian or Continental Portuguese, we’re all Portuguese at heart. And thank you for the kind words. I’ve received such amazing support from the Portuguese communities around the world, Brazil included. I’m so happy you enjoy the recipes. Best wish to your husband and daughters. Wow these sound great! I was just looking for a Salt Cod Fritter recipe, can’t wait to try them. Regards to all and enjoy your cooking! Sandra, I appreciate your waving the Portuguese flag. The Portuguese and Spanish share so many recipes—each country and region putting its own spin on it. Pastéis de bacalhau (all potato) and pataniscas (all flour), both of which I feature in my cookbook, are different from this recipe. This Spanish fritter contains both potato and flour. And the batter is similar to a French pâte á choux—something not usually called for in patinascas. Last, unlike our perfectly shaped bolinhos or pastéis, these are so irregularly shaped, they have more crunch. But all of them are delicious! David, now you must try Málaga codfish balls/fritters. They are crisply fried and served drizzled with molasses. Brilliant, the salty and sweet. Janet, now you must share the recipe here. They sound wonderful. I know of them but never partook when I was in Málaga 28 years ago—I was in my youthful (read: foolish) refutation of everything Portuguese period. No potatoes, not choux batter. Add shredded bacalao to batter (flour, egg yolk, parsley, garlic, saffron, baking powder), consistency of pancake batter. Fold in stiff-beaten egg white. Drop by spoonfuls into hot OLIVE oil, turning to brown. Serve hot drizzled with molasses. You don’t need much of the sweet stuff. Molasses a by-product of now almost disappeared sugar cane refineries in Málaga. Yep, 28 years ago sugar cane grew next to the runways of Málaga airport. Janet, how much of each ingredient? Because of the chemical reaction of the baking powder, we need a sense of proportion—especially for readers who’ve never made these before! 1. Put the cod in enough water to cover and bring to a simmer over low heat and cook until it flakes lightly with a fork, 10 to 15 minutes. Remove from the heat, drain—saving the cooking liquid—and let both the cod and liquid cool a bit. When the fish is cool enough to handle, flake it. 2. Combine the parsley, garlic, saffron, and egg yolk in a medium bowl. Beat in 1 cup of the reserved cooking liquid. Combine the flour and baking powder in another bowl. Stir the egg yolk mixture into the flour mixture until smooth. Add flaked cod. The batter should be consistency of pancake batter. Let rest 1 hour. 3. Beat the egg white stiff and fold it into the batter. 4. Add the oil to a skillet to a depth of 1 inch and heat until shimmering. Drop the batter by the tablespoons, turning to brown on both sides. Drain the fritters on paper towels. Serve them hot drizzled with molasses. © Janet Mendel. All rights reserved. Seu site e maravilhoso! Quantas receitas boas para experimentar! Gostaria de saber se o senhor poderia me indicar um site de confianca onde poderia comprar bacalhau seco (o lombo, nao aqueles fininhos que se acham por ai). Como neta de Portugues (de Soire, Coimbra), mesmo sendo Brasileira, cresci comendo muita comida Portuguesa. Agora, morando nos EUA, simplesmente nao acho bons salted cods. Infelizmente, na regiao que eu moro (Atlanta, GA) nao existe nenhum mercado onde eu possa encontrar bacalhau salgado. Obrigada e parabens por compartilhar esse maravilhoso dom culinario conosco! Muito obrigado! La Tienda has excellent, thick salt cod fillets. You can purchase them here. Hi, Omer. These are one of my favorites. I can never get enough of them when I’m home. we have a Leite family in town ludlow, mass. any relation? Omer, not that I know of. But how many times have I gone somewhere and a perosn comes up to me and says, “We’re cousins.” So who know?! I don’t eat meat but I love fish. I was looking for different ways to cook fish to add variety to my diet. This recipe is definitely one of my favorites. The taste is amazing and they were lovely and light. I used my own batter I had made yesterday, which is not as thick so the fritters weren’t as uniformly shaped or as round as these. Hi Olwyn, so glad that you like them. We have lots more fish recipes on the site, please let us know if you try another. Making your amazing salt cod fritters from the home of salt cod in Harbour Grace, Newfoundland. They are fantastic. I was a little skeptical of the oil water batter but it worked a treat. Thanks for the great recipe. Susie, my pleasure. So happy that they worked out. If you make them again, send me a picture. Hi, these sound very similar to our pataniscas de bacalhau :) must give these a try. 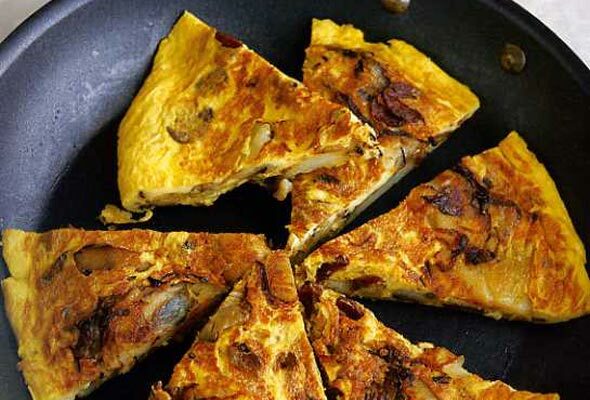 Katkastro, they are indeed, although pataniscas traditionally are flat like fritters. If you make them, let me know what you think. Absolutely fantastic. I’ve been looking for a recipe like this since traveling to Spain five years ago. All others I tried were dry. Like others, I put the onion in the food processor before adding the cod. Too bad this is fried. It will going to a regular rotation if not. Jana, thank you. Did you have some fritters in Spain that weren’t fried? Every cod fritter I had on the Iberian Peninsula was fried. Hello there! I am planning on making these for a party in a couple weeks and I was wondering: Is there any way to freeze them? Either before frying, or after frying and then popping them in the oven? I’m making a whole bunch of hors d’oeuvres and anything that I can get done ahead of time will save me stress the day of. I wouldn’t, however, want to risk them coming out soggy… or splattering me with hot oil if I were to fry them after freezing. Maybe a could freeze the mix, defrost it a day before and then fry it? Any ideas or comments would be greatly appreciated. Thanks a bunch! Laurel, I have not tried this, but I do know some cooks who fry them, let them cool, and freeze them. They then defrost them and reheat them in a 350° to 375° oven until heated through. Thanks David! What do you think of making the mix with the cod, potatoes and flour batter, freezing that, then defrosting it and adding the eggs before frying? Too weird? Laurel, I think that method will cause a change in texture. Thanks for your responses! I’ll let you know what I decide to do and how it goes! LOL….I tried to upscale the recipe to a little over a pound of salt cod and totally screwed this up. After trying to fry two batches in oil, which basically totally disintegrated, I took a moment to figure out how to save my dinner. I oiled up a non stick pan and then basically made a salt-cod hash. I kept flipping and flipping and flipping until I had a nice brown crust….and it was really very good. Basically, this recipe didnt work out quite the way it was supposed to (because I added too much of the “batter” mixture), but with a little bit of improv I was still able to make a tasty dinner…..and it was actually easier (making it like hash) then it would have been to fry a bunch of fritters. Thank you for the inspiration. I will be making this “salt-cod hash” lol, again. rich, excellent save! Yeah, I don’t freelance my first time making a recipe, but after that, watch out. David, this looks so delicious I can’t wait to try it! I’m wondering if, since the recipe incorporates a choux batter, it can it be baked instead of fried? I just made a salt cod by using the Saveur homemade salt cod recipe. Afterwards I rinsed and cooked the cod sous vide. I’m at the stage where I have the cooked cod in the sous vide bags and am trying to figure out the best thing to make with it. Would the baked salt cod choux just become hollow if I baked it? I tried the original recipe and it was gobbled up quickly so I needed to make another batch. This time I used a more traditional pate choux ratio in the mix (the original is thinner) and baked them at 425°F. They were not as crispy as the fried and they did not hollow out. They were pretty good. Not a bad alternative if you don’t want to make a mess frying. The fried ones with the thinner, cooked flour batter were more custardy in the middle and crisper on the outside however. Vickie, glad you liked the original recipe, and yours sound lovely, too! Vickie, just getting to this. Sorry. I think you answered your own question! While searching salt cod fritters recipes, I found yours. When it mentioned Allium in Gret Barrington, I suspected I had a winner. I was not wrong! These were amazing and devoured quickly by all. Thanks for the wonderful recipe, and for giving our family a new holiday food tradition! Merry Christmas! Deb!! Well, that’s what I love to hear. This is a great recipe, as is the resto Allium. And your photo is terrific. Wishing you and yours a wonderful holiday season and a Happy New Year!